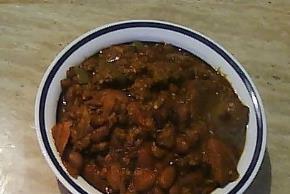 1) (If canned beans, drain and add in step 2) Boil beans following directions. While beans boil, cook bacon & beef. 2) Add all of the other ingredients together in a big lobster pot or divide ingredients into 2 big cooking pots. Stir well and add your meats. 3) Put on stove and bring to a boil. Reduce to medium to simmer. When beans finish stir them into the pot. Simmer until it reaches desired thickness stirring frequently. Add chili powder & salt if needed. Top each bowl with cheese.